The jewelry company founded by Erastus Barton in 1810 at No. 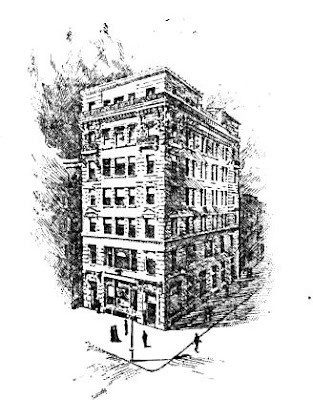 166 Broadway had come a long way by 1898. Now known as Black, Starr & Frost it had a reputation equal to Tiffany & Co. for its high-quality jewelry, sterling silverware, clocks, watches and related goods. As the shopping district catering to the carriage trade crept uptown, so did Black, Starr & Frost. It had moved five times and now was preparing to do so again. In 1893 the looming Waldorf Hotel opened on Fifth Avenue and 33rd Street signaling the encroachment of business into the residential neighborhood. The jeweler would be close behind, opening its new marble home on April 1, 1898, years before the arrival of Tiffany and B. Altman & Co. who would follow suit nearby. The new building replaced two broad mansions at Nos. 436 and 438 Fifth Avenue, at the southwest corner of 39th Street. Seven-stories high, the rusticated Beaux-Arts structure was at the same time opulent and refined. The Fifth Avenue and 39th Streets facades were equally impressive. Juliette balconies with ornate French railings projected from the sixth floor. One floor above, a stone balcony wrapped the building supported by paired, scrolled brackets. Surrounded by the mansions of New York’s wealthiest citizens, the white marble oozed class. In the meantime, another jewelry firm was making its mark. In 1868 Jacob Dreicer opened his jewelry business at No. 1,128 Broadway. At the time, socialites festooned themselves in pearls, essentially ignoring colored gemstones. Although Dreicer and his son became important pearl dealers—one 30-inch string of perfectly-matched pearls put together by the firm sold for $1,500,000 and single pearls from the store went for as high as $130,000—they were instrumental in establishing the popularity of colored gems. Decades later The New York Times would say “The father and the son are credited with having done much to overcome these prejudices and to have aided in creating in this country a taste for beautiful gems and exquisite art in jewelry.” A single diamond, known as the Duke of York diamond, was sold for $125,000. 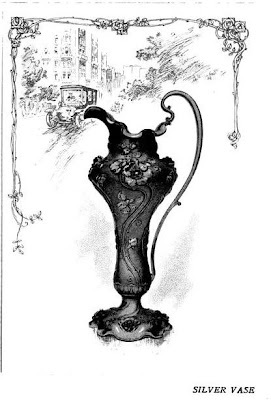 Black Starr & Frost sold this up-to-the-minute Art Nouveau silver ewer here in 1910. Son Michael Dreicer continued in the family business, but actively involved himself in real estate as well, focusing mostly on the development of Fifth Avenue. In April 1904 he shocked real estate investors by paying $1 million for the 39th Street corner where the six-year old Black, Starr & Frost building stood—the highest price ever paid for Fifth Avenue property. Dreicer explained that he purchased the property as an investment for his children. In order to keep it in the family, “Mr. Dreicer is said to have arranged matters so that none of his children can dispose of a share in it without the consent of all the others,” reported The Times. The purchase no doubt annoyed brothers F. V. and J. H. Burton—known in real estate circles as the Burton Brothers—who by now had managed to buy up the entire block, except for the 39th Street corner. The brothers were the largest holders of realty in the Fifth Avenue area. Brownstone mansions still filled the block, wrapping around the stately building, presenting a ripe plum for development. Shortly afterward, Black, Starr & Frost was on the move again. In July 1909 the jeweler purchased the Charles T. Cook mansion a few blocks north at 5th Avenue and 48th Street, and exactly one year later moved into its new building designed on the site by Carerre & Hastings. 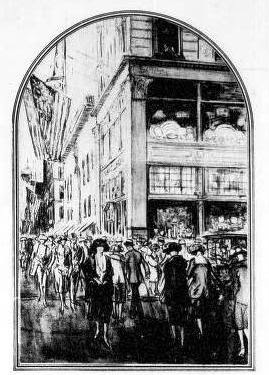 In October 1912 Lord & Taylor decided to abandon its grand Victorian emporium on Broadway. The department store leased from the Burton Brothers all the property on the west side of Fifth Avenue between 38th and 39th Streets “except the Dreicer building on the Thirty-ninth Street corner,” said The Times. Construction on its new building designed by Starrett & Van Vleck began the following year and was completed in 1914. The impressive 10-story Italian Renaissance structure engulfed Dreicer’s. In the meantime, in February 1912 A. A. Vantine & Co. had leased the entire Dreicer Building. Its subsidiary, Aitken Company, took over Black, Starr & Frost’s former retail space. Aitken had established itself as one of the select dry goods stores in the city, having done business from Broadway and 18th Street for four decades. Vantine & Co. operated Vantine’s “The Oriental Store.” Exotic gifts like Chinese porcelains, Japanese tea sets, Turkish rugs and lacquered ware were sold here. With the change in tenants, Michael Dreicer announced planned renovations for the building that would add five stories at a cost of $100,000. Although plans were filed with the Building Superintendent on April 20, 1912, they were never carried out. 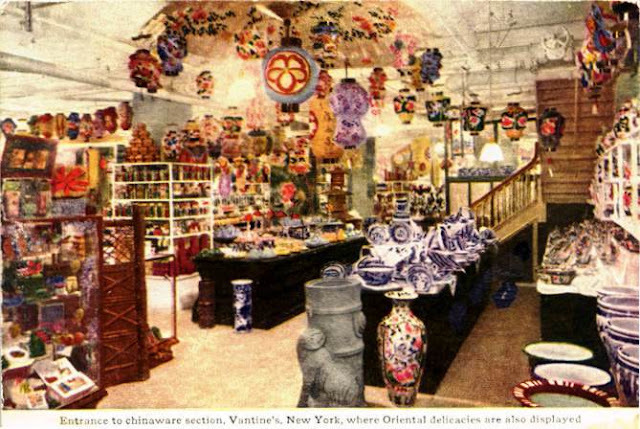 Vantine's sold a dizzying array of "Oriental delicacies." A 1921 Ovington's advertisement shows the renovated lower floors. The high-end store filled the building with exclusive goods aimed at moneyed customers. The first floor displayed Venetian glass, Nancy glass, smoking items, Florentine leather and other gifts. On the second floor were clocks and Italian marbles, tapestries, bronzes and silver. The china department was on the third floor, crystal on the fourth and home furnishings were on the fifth. Here women could sort through tea wagons, mantel mirrors, lamps and shades, and other items for the home. The following month Michael Dreicer died. At only 53 years old, he had amassed a tremendous fortune not only through his jewelry business; but through his extensive real estate holdings. He bequeathed an art collection valued at more than $1 million to the Metropolitan Museum of Art. In March 1935, with Ovington’s now gone, Beyda & Co., dealers in linens, took over the store, mezzanine and basement. The corner property that Michael Dreicer snatched up before the Burton Brothers could buy it was finally absorbed when, in 1986 Lord & Taylor’s parent company, Associated Dry Goods, signed a lease for the entire building. The ground level Lord & Taylor façade was reproduced around the 39th Street corner, including the vast show windows with their Roman upper sections. Only the rear section retained its rusticated first and second floors. In a bustling city where busy pedestrians rarely look above street level, no one notices that Lord & Taylor’s mammoth store is really two buildings. The white marble home of a Victorian jeweler that once sat among brownstone mansions is largely overlooked.